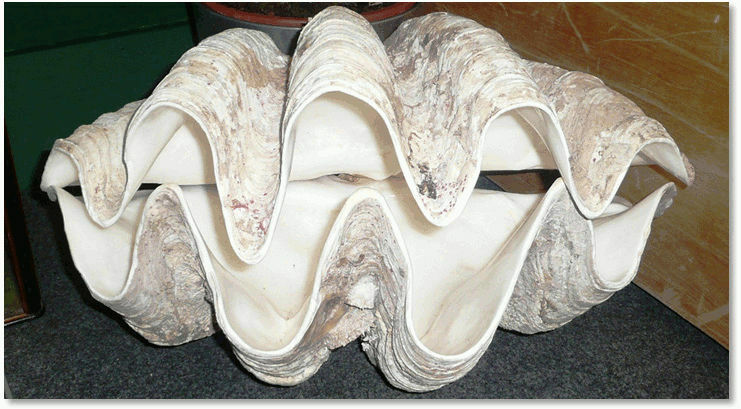 Giant clam. The scientists drilled tiny, precise holes that exposed daily growth lines and built up a temperature record spanning 2500 years (see below). Click for larger version. Are current temperatures hotter than ever? Was there a Medieval Warm Period somewhere in the world in addition to the area surrounding the North Atlantic Ocean, where its occurrence is uncontested? This question is of utmost importance to the ongoing global warming debate, for if the Medieval Warm Period is found to have been a global climatic phenomenon, and if the locations where it occurred were as warm in medieval times as they are currently, there is no need to consider the temperature increase of the past century as anything other than the natural progression of the persistent millennial-scale oscillation of climate that regularly brings the earth several-hundred-year periods of modestly higher and lower temperatures that are totally independent of variations in atmospheric CO2 concentration. The CO2 Science web site thus introduces a literature review of temperature studies around 950–1400, known traditionally as the Medieval Warm Period. The Center for the Study of Carbon Dioxide and Global Change was founded by Dr Craig D. Idso (the present chairman), Dr Sherwood B. Idso is its President and Dr Keith E. Idso its Vice President. Craig and Keith are brothers, Sherwood is their father; each is a respected scientist with an impressive publication record. It crops up repeatedly: but there was no medieval warm period (MWP), therefore the modern warming is unprecedented. The CO2 Science web site has a long-running project to examine records all over the world concerning temperatures in the medieval period. Their overview page makes a great introduction to the project. They cite material from hundreds of scientists and institutions. Really quite impressive. So when will the warmists stop saying there was no medieval warm period?